Join UoL's Dr Will Slocombe, the Liverpool Geek Girls and others for an event on the future of tech, the gig economy and taxing robots. “Truth or Dare but without the Truth.” This scary tagline sums up Nerve, a social media game that drives the film of the same name. We follow 17-year-old Vee’s immersion in the game, where “players” earn money for completing dares to kiss strangers or shoplift $4,000 dresses. As you’d expect, the dares quickly escalate with the vicarious demands of the “watchers” (gamers who pay for the privilege of watching rather than taking part) – riding a motorcycle blindfolded at 60mph, for example. What emerges is a series of somewhat trite, but nonetheless pertinent, observations on social media and the politics of celebrity and voyeurism. Given that the reality of AI may be fast approaching, it’s of the utmost importance that we work out what might a future with artificial intelligence might look like. Last year, an open letter with signatories including Stephen Hawking and Nick Bostrom called for AI to be of demonstrable benefit to humanity, or risk something that exceeds our ability to control it. 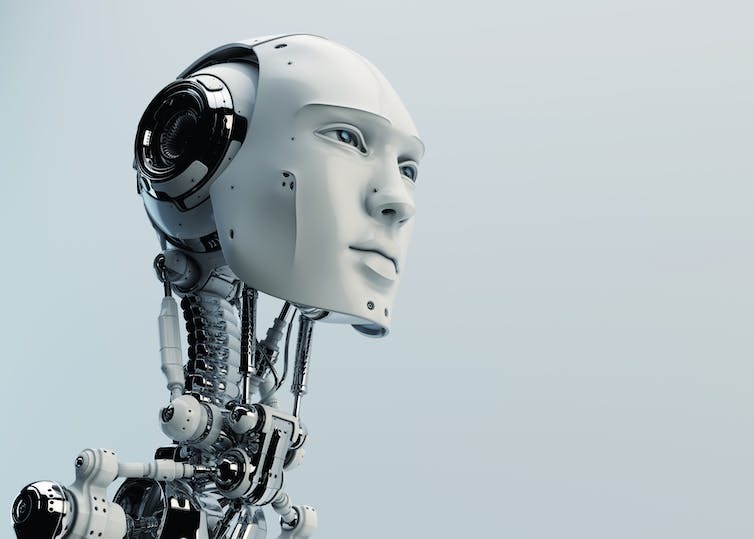 Robots, aliens, corporate drones - who will be the citizens of the future? In the 1940s, science fiction author Olaf Stapledon gave a talk to a school about the future. Addressing his audience as “you citizens of the future”, he proposed three visions for this future: the “destruction of the human race”, a “worldwide police state”, and “an entirely new kind of human world”. 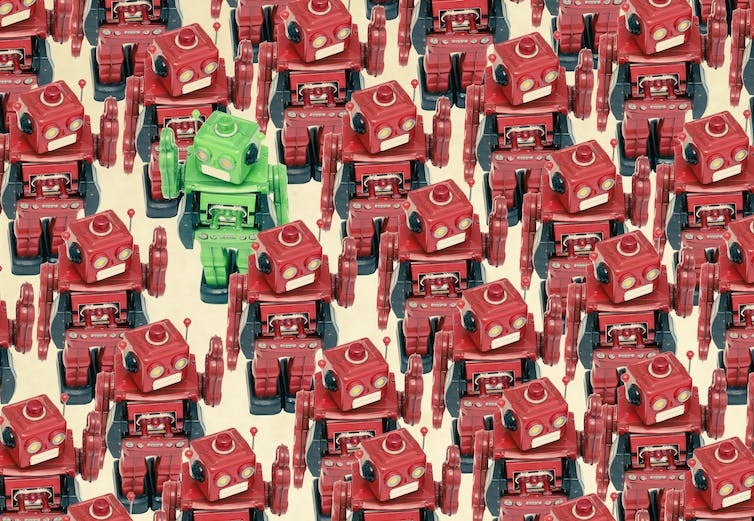 Robots, aliens, corporate drones – who will be the citizens of the future? Citizenship will not be such an important issue if Stapledon’s first vision comes to pass. But any future in which humans persevere or flourish will be accompanied by a repeated need to reassess what a citizen is. As we increasingly consider what and where we are citizens of in the face of recent political events in Britain and America, what “citizens of the future” might look like takes on new resonance. And it’s something that science fiction has long imagined. Citizenship obviously has different meanings. Etymologically, it implies the inhabitant of a city, but its connotations cut across legal, geographical, cultural and racial senses. Nobody necessarily agrees on what citizenship is, let alone who should have it. This is further compounded when we consider who the citizens of the future might be, from the “next generations” of children and grandchildren, to questions around the political, economic and geographical landscapes that will redefine current debates about citizenship. The most common science fiction setting – space – is the site of one such redefinition, as humanity expands into the universe. This is something of a stalwart of science fiction from Star Wars (the Empire and the Galactic Senate) to Star Trek (the United Federation of Planets). In both cases, humans and aliens are part of the same political organisations. In Star Trek especially, the different series examine the various tensions surrounding Federation membership, from the inclusion of the Klingon Empire in The Next Generation to the founding of the Federation in Enterprise. Even without aliens, science fiction has examined how humanity might be governed as it colonises space. One of the most explicitly political of such works is James SA Corey’s recently adapted Expanse series. The Expanse sets the United Nations (as the governing body of Earth) against the Martian Congressional Republic and a “terrorist” Outer Planets Alliance. Here, a corollary between citizenship and colonialism comes to the fore. Citizens of the Belt imagine themselves to be citizens of one place (the asteroid belt between Mars and Jupiter) but are in fact governed by Earth, Mars and corporations based on those planets. Much science fiction imagines some such incarnation of a “world citizen”, often emerging from space colonisation and a decline of national borders. 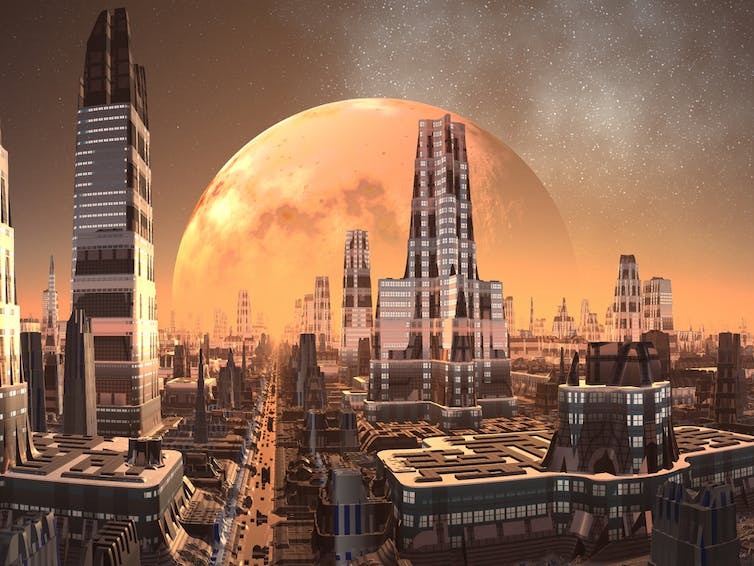 Some examples of “post-nation-state” science fiction are concerned with the rise of mega-corporations (such as William Gibson’s early cyberpunk fiction or Continuum). Others explore the increasing homogenisation of humanity, as racial characteristics (broadly identified) become mixed across large sections of the population. World citizenship isn’t necessarily imagined as a consumer hell or socialist paradise. 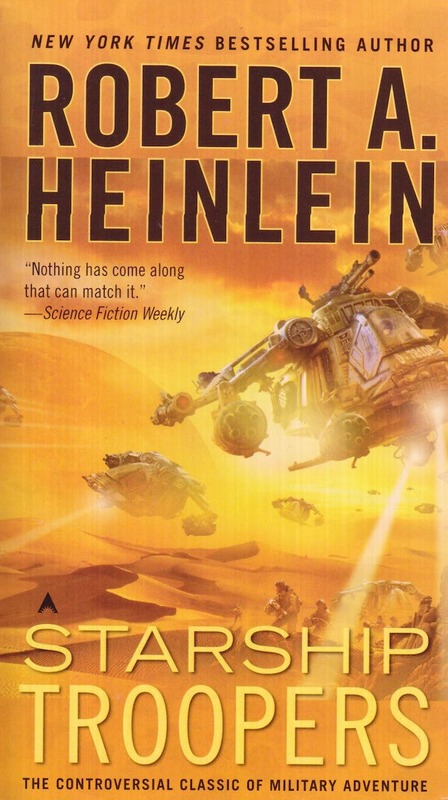 One of the most famous, and perhaps provocative, examples of global citizenship in science fiction is the one portrayed in Robert Heinlein’s Starship Troopers. Heinlein’s “citizens” are the opposite of civilians. In this novel, citizenship equates to being given the right to vote in the State (the Terran Federation) and is only earned via federal service. In effect, Heinlein seems to be advocating limiting the right to vote to those who serve the State and, given that this service is often military, for many readers Heinlein’s sense of “world citizenship” is quasi-fascistic. Heinlein justifies this militaristic “citizen of the world” by the existence of an outside enemy — the Bugs. So citizenship here remains a case of “us” and “them”: what unites the world and humanity is a shared enemy beyond the State. Some authors are more overt about the ways in which the concept of citizenship can itself be redefined. In Orson Scott Card’s Speaker for the Dead – the sequel to his famous Ender’s Game – he introduces the Hierarchy of Exclusion, a framework that determines how “foreign” other nations, planetary populations, and species are. The Hierarchy of Exclusion codifies the ways in which categories of “us” and “them” are decided, and as one of his (alien) characters comes to realise, “the tribe is whatever we believe it is”. Another recent example is Ann Leckie’s Ancillary Justice, which underscores what happens when any particular racial or cultural imperative, whether a notion of “the human” or being born within a particular caste, comes to stand as a measure of citizenship. In her novel, she equates the struggle of a colony planet seeking independence from the empire with an Artificial Intelligence (AI) seeking to obtain its own legal identity. Both cases revolve around notions of citizenship, which Leckie rather cannily reframes in terms of “Significant Beings”. The most sophisticated autonomous robots could be established as having the status of electronic persons with specific rights and obligations. As The Independent reported, this implies that a robot could be legally a citizen. Yet in the same report, the committee advocates that designers include “opt-out mechanisms (kill switches)”. This creates a potential situation where an “electronic person” could be programmed with a kill switch – surely a somewhat self-contradictory gift of citizenship? So where does all this leave the notion of “citizens of the future”? Aliens — in both senses — can become citizens (if our understanding of citizenship shifts), as can robots (if we have the means to kill them). But citizenship depends, it seems, as ever upon who we call “us” and who we call “them” – citizenship understood as an exclusive club. Elsewhere in his writings, Stapledon counselled himself to “think cosmopolitanly” – that is, to think inclusively, outside of national and even anthropocentric structures. As citizens of Stapledon’s future, it seems we are still failing to consider citizenship in such innovative terms, even now. For all the speculations inherent to the field of science fiction, it appears that we still often limit ourselves, even in our imaginations, to a moribund sense of citizenship. This article was written as part of the Citizens of Everywhere project, organised by the Centre for New and International Writing at the University of Liverpool. @CitizensofWhere #CitizensofEverywhere.